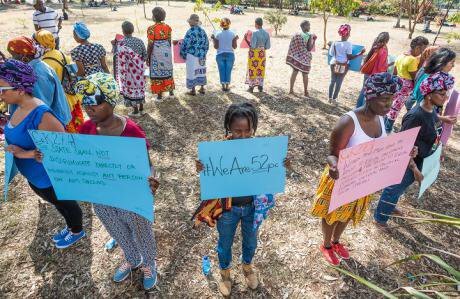 A silent protest by women in Nairobi about women's representation in politics. Photo: Jerry Riley. All rights reserved.Many years ago, just before I became a teenager, my mother and my aunt rescued an 11-year old relative who was being forced into “marriage.” I don’t remember the full details of what happened but there were many conversations in my family about it. The girl’s mother was my mother’s cousin. My relatives talked a lot about what her father’s relatives were planning to do. Her parents had died when she was a baby and she had lived with them since then. My mother and my aunt decided to intervene. They made the journey from Nairobi to Lamu and literally stole her during the night. She was then delivered to her older sister’s house, where she lived until adulthood. When I think about my feminism, and try to identify when I became a feminist, I remember this incident. I remember looking at my mother, in awe of her boldness. She was like a fierce warrior, ensuring that a young girl was not forced into marriage. I remember feeling that that’s who I wanted to be too. I remember looking at my mother, in awe of her boldness. This feeling stayed with me and grew when, years later, in high school, our english teacher Mrs. Ondiek wrote a poem called “Equality, change the slogan” for us to perform at a drama festival of schools in Nairobi. The poem, and our dramatised performance of it, was so good that we became high school drama champions of Nairobi, and third nationally. It challenged us to go beyond women’s equality slogans to policy-making and system-changing, and noted that the goal is not a reversal of gender roles. Feminism came slowly to me, through years of experiences which led to questions about the state of the world around me and my place in it. As a young woman, reading and talking about these issues helped me to stitch together the language I needed to understand and explain what feminism is and what it meant to me. Finally, I chose to consciously identify as a feminist, which has since been a journey of re-discovery, unlearning, and learning that has now rooted my feminism in actions and interactions with other people and with the systems I exist and move in. This is not uncommon; feminism has come to many African women over periods of time, through similar moments with their mothers and grandmothers, teachers, neighbours and other women they observed growing up. Many of these women, despite performing socially-prescribed gender norms, still found small and big ways to resist them and to build small stepping stones that led to the boulders we stand on now. Sometimes, grandfathers also helped imagine what it meant to be a full human as an African woman on the continent. While not always identified as such, feminism is as much a part of who we are as being African is. The only difference is that being African was considered an innate thing, something you are from the moment you’re born. Likewise it would be unfair and disingenuous to try and pinpoint just one thing, or just one moment, to define African Feminism. This revolution is a multi-generational and multi-layered movement. It’s also single moments, words and actions that, even on their own, are complete, complicated and valid expressions of this movement. We are the accumulation of past words and actions. We are also how we define ourselves. We cannot dictate the authenticity of a movement which by its very nature is ever-evolving and changing to accommodate the new and discard the no longer useful. It is impossible to say that feminism is un-African when African women right now are feminists. In numerous debates, articles and conversations on social media I have heard the mistaken idea that ‘feminism is un-African’. But in order to claim something as ‘un-African,’ I believe that you must have to prove, beyond a doubt, that there is no history of Africans doing that thing and that there are no Africans doing it right now. It is easy to claim that something has never been done by Africans. We know that history is distorted and has been shaped to suit its narrators’ interests. As women know intimately, it is easy to erase the memory of our existence, contribution and participation in history. Relying on such distorted historical accounts is difficult. However, it is impossible to claim something is non-existent when there are people, in the right here and now, doing that thing. It is impossible to say that feminism is un-African when African women right now are feminists. And African Feminism right now does not exist in a vacuum – it was borne by African Feminism in the past. It is impossible to disconnect us from African women of the past; the mothers who rescued girls, the teachers who taught us about equality, and many others. To do so is to erase them and to also erase us. We African women, right now, are carriers of culture, in our own right. And culture is dynamic. If every African, on the continent and in the diaspora, can ‘claim’ Africa in some way, then African women have a right to redefine and recreate African cultures. Our validity does not rest on a connection to the past. We exist right now, as those single moments of the movement that do not require explanation or justification. African Feminism exists because African feminists exist. It is impossible to separate one from the other without violently separating African women from Africa.